Chen-style Taiji Single Broadsword is one of the short weapons. The original routine has 13 movements and so it is called the 13-form Broadsword. This routine is short and its every movement is practical and powerful. Its 13 methods suh as roll, close, thrust, block, chop, cut, intercept, twine, slice, parry and raise in straight arms, truly showing Chen-style Taiji Quan's special characteristics of hardness and softness in harmony, fastness and slowness in interval and looseness and agility in movements. The broadsword is played as powerful as a tiger jumping down a hill, with the advantage of long and short weapons. There are 35 movements in the Double Broadsword routine, which are reasonably and cohesively arranged. Its main movements include hack, chop, parry, thrust, intercept, press, push, slice, block and swing in figure-8 form. 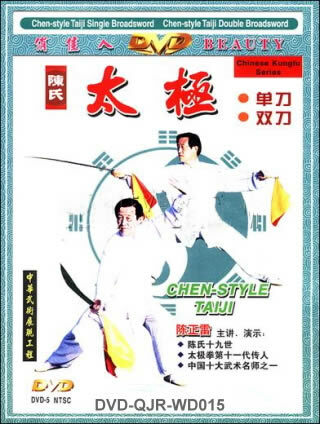 With smooth and round body movements and agile and stable footwork, the two broadswords are wonderfully played, fully embodying Chen-style Taiji Quan's features of hardness and softness in harmony, fastness and slowness in interval and looseness, activeness and explosiveness in force application.